Bahria Town management has issued another notification for the members of Bahria Sports City. 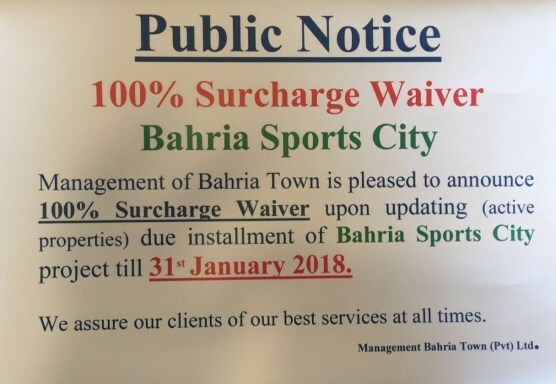 The notice indicates that Bahria Town will waive off 100% surcharge upon updating due installments of active properties. This offer is implemented on residential plots and 350 Sq Yards Villas, and on those files which have already paid at least three or more installments. The last date for updating files is 31st January 2018. Well composed Blog that is updating the audience on latest Bahria Sports City news. The latest deal in Liberty Commercial Bahria Town Karachi is launched. For more inquiries click on the link below.